Scientists generally agree that, by the year 2100, climate change will most likely make hurricanes stronger. But what about the hurricanes of this year and next — is climate change already worsening those? The science is much less clear in that regard. And what about other factors, like hurricane frequency and where they make landfall? These questions will guide a new project led by Adam Sobel, an atmospheric scientist at Columbia’s Lamont-Doherty Earth Observatory. Through funding from Swiss Re Institute, the team will investigate climate change’s effects on the number, intensity, and trajectories of hurricanes in the Atlantic and Caribbean, both today and 10-20 years into the future. The team hopes to get to the bottom of these questions by taking a different approach from other researchers. “It’s one that is based on the need to make actual decisions even in the face of uncertainty,” explains Sobel. It has been difficult to pin down whether hurricanes are already getting stronger because the best data are only a few decades old, and hurricanes vary a lot even under natural circumstances. 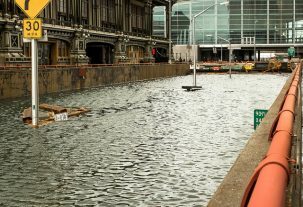 Nevertheless, governments and businesses still need to make informed decisions for the future — such as whether to allow developers to build in a certain area, how high to construct a sea wall, and how much to charge for insurance — even if the current data aren’t perfect, Sobel points out. Instead, he and his colleagues will use a strategy from Bayesian statistics; they’ll use models to make their best assessment of what they think is happening — that climate change is making hurricanes stronger, for example — and then see how well the data support it. In this type of analysis, if the data are uncertain, then the initial assumption will be supported. The hypothesis stands until the data prove it wrong. The team will also use observational data, global models, and a hurricane hazard assessment model that they themselves developed, to look for the fingerprints of climate change in past storms, and to generate a better understanding of how hurricane intensity, track and frequency could change in the next few decades. In one year, the project aims to turn out results that have real-world implications. And the results will not just be useful for Swiss Re, says Sobel. Any climate adaptation measure that requires a cost-benefit analysis — from deciding how high to build a sea wall to developing new financial products to manage disaster risk — needs an assessment of the hazard that takes into account both rare events like severe hurricanes and how those are affected by warming. Finding better ways to determine climate change’s effects now and in the near-term will be essential to adapting to whatever the future holds.